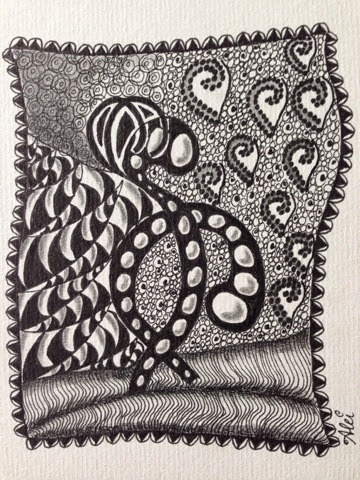 One of my favorite zentangles I made for Jorinde, my physiotherapist. A while ago, I sufferd from chronic hyperventilation and I went to a physiotherapist for a few months. And she learned me to breathe again. There was one excercice I had to repeat and repeat over and over again, and it inspired me to make a zentangle of it. Sitting on a chair... breath in - move forward, breath out and relax - move backwards. And after two months, I felt much better ! Thank you Jorinde. I put it on my blog, so I should never forget how to breathe in an easy, relaxed way. This is what I made of it, and I gave the tile to Jorinde on my last session.